Submitted photos The Pickin’ in Parsons Bluegrass Festival has grown to attract more than 3,500 people annually, with a range of talented groups playing traditional music over a period of five days. PARSONS — A popular local bluegrass festival has gained international notoriety, much to the delight and surprise of its founders. The Pickin’ in Parsons Bluegrass Festival was selected as the 2017 Event of the Year by the International Bluegrass Music Association. Joyce Ann Bowers, who hosts the annual festival at Five River Campground with her husband, John Bowers, said they never dreamed they would win such a prestigious award. Pickin’ in Parsons had made it to the semi-finalist round, which included five bluegrass events from throughout the world: Bloomin’ Bluegrass Festival & Chili Cook-Off in Farmers Branch, Texas; Bluegrass & Chili Festival in Claremore, Oklahoma; Emelin Theatre Bluegrass Concert Series in Mamaroneck, New York; Pickin’ in Parsons; and the 25th Bluegrass Music Festival in Ulster American Folk Park, Northern Ireland. When the awards were announced Sept. 28 at the 28th Annual International Bluegrass Music Awards in Raleigh, North Carolina, Joyce Bowers said she and her husband were sure the festival from Northern Ireland would win. She added it’s a huge honor to even be nominated, so they were both ecstatic about the award. The IBMA is a trade association for bluegrass professionals, and its awards are given to musicians, vocalists, promoters and agents during a weeklong conference. Nominees in each category are selected by a special committee of bluegrass music professionals who possess significant knowledge of that field. The recipient of each award is decided on by the Panel of Electors, an anonymous group of more than 200 veteran bluegrass music professionals selected by the IBMA Board of Directors, according to information provided by IBMA publicist Judy McDonough. 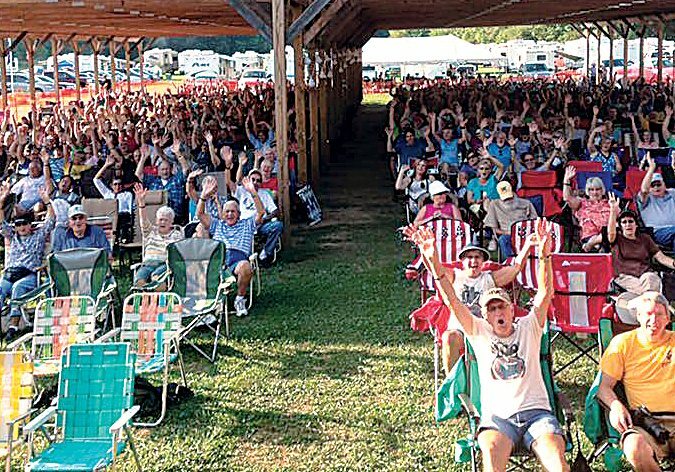 The Pickin’ in Parsons Bluegrass Festival is a five-day event of Tucker County that has grown to attract more than 3,500 people annually. Joyce Bowers said this year’s 14th annual festival attracted attendees from 10 different countries, who came to hear a talented mix of 25 musical groups. She said the festival offers a family-friendly atmosphere, campfire jams and beautiful location at their campground along the Shavers Fork River, and many festival attendees come back year after year. “It’s like a little community here,” she said, explaining folks can expect to see familiar, friendly faces whenever they visit. She greets people at the gate; her husband is stationed at the stage; and 12 family members and friends volunteer to help run the festival each year. One of the bluegrass artists to perform several times over the years is Ronnie Reno, who also is scheduled to take part in the 15th Pickin’ in Parsons event with his band, Reno Tradition. The festival dates are set for July 31 to Aug. 4, 2018. Reno said the festival keeps getting better each year, and the crowds are fantastic. Reno added the Event of the Year award is well-deserved.